Like tumbled tombstones marking the graveyard of self-referential Modernism, the exhibition at the Museum of Contemporary Art in Lyon presents a remarkable set of remembrances to ponder. 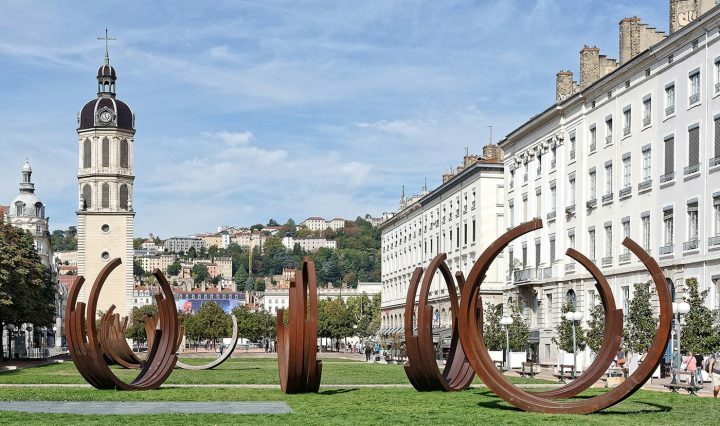 LYON, France — Bernar Venet Retrospective 2019-1959 is the most ambitious and far-reaching show ever devoted to Venet, who in 2015 became a Knight within the National Order of the Legion of Honour, and in 2016 received the Lifetime Achievement award from the International Sculpture Center (ISC). Venet is well-known for his monumental, big bucks Indeterminate Lines sculpture series, such as the piece “88.5 Arc x 8” (2012) installed at Gibbs Farm in New Zealand. But for me, these impressive, looming Corten steel sculptures are over-determined and never seem to do the psychic job of acknowledging, protecting, interceding, or advocating for those who suffer or rest or play under them. Perhaps they need viewers more than viewers need them. But spaciously congregated here by curator Thierry Raspail is a previously unseen ensemble of 170 diverse and jarringly inconsistent (quality wise) artworks of less notoriety — including documentation of early droll and laconic performances, some surprising sound works, and his frequently disparaged and dismissed diagrammatic paintings, such as “Related to: Zig Zag Path Zuv Between Nodes U and V in a Planar Mesh” (2001). 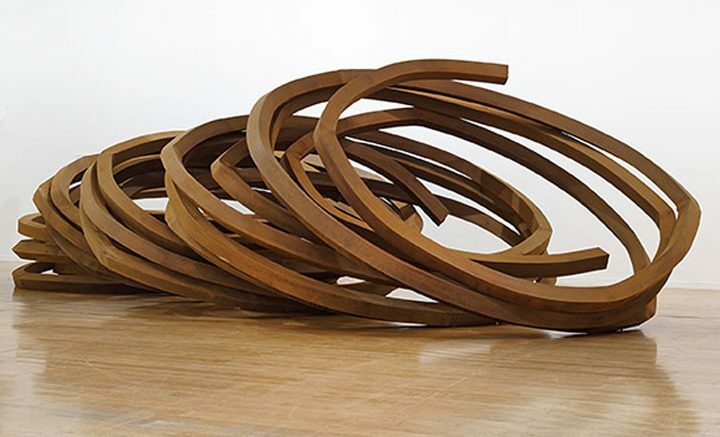 Though interesting as artistic development, little in this retrospective provides the rich aesthetic pleasure of Venet’s ruddy, rusty sculptures when under the pressure of gravitational breakdown, such as the beautiful and tragically elegant “Arcs in Disorder 11 Arcs” (2014) that appeals to the pointless pessimist in us all. Unified by its beautiful, sensual, rusty color this thrown-down failure at holding rational order seems like a timely defensive metaphysical principle: e pluribus unum (out of many one). This tossed, casual look also works well for Venet’s sculpture “Collapse: Five Indeterminate Lines” (2009) that animates a group of circular metal forms that when vertically arrayed can look stodgy. Thus it was a delight to see at the inauguration Venet actually push over, with great noise, a group of rusty metal beams that had been casually leaning against a wall. So that they all, but one, ended up delightfully randomly arranged on the ground in a sculpture he calls “Accident” (1996/2018). With that shove, Venet thankfully topples certain Modernist mandates concerning reducing our attention to the objectness of art. Less impressively, he also man handled before me some metal, rectangular poles that had been painted with tar or black paint. 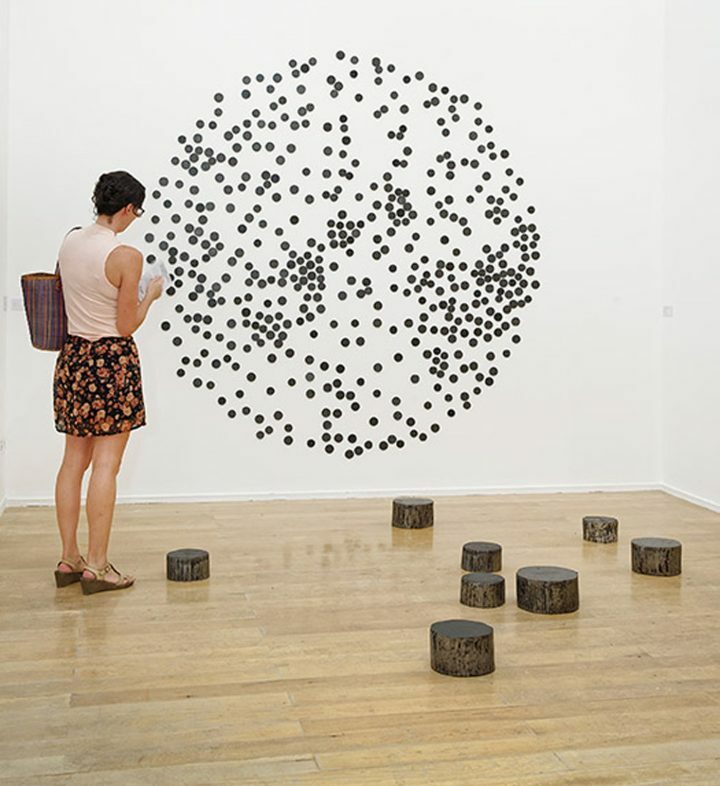 Scraping them on the wall so as to leave marks for pieces he straight forwardly titled “The straight line – The object line / The instrument line / The trace of the line as a tangible memory of the pictorial gesture” (2007). “Collapse: Five Indeterminate Lines” (2009), “Collapse: 9 Angles” (2011), “Points / Disorder / Dispersion” (2014) and “Random Combination of Points” (2009–2018) all have a superior look of chance lyricism and some hint at the fascinating structures behind the music of John Cage. This sense of curious whimsy is often lacking in Venet’s public, monumental arcs, that can feel craned in, plopped down, and pointlessly domineering. All of the “Collapse” pieces, which I love, were on the first floor, for as indicated in the show’s title Retrospective 2019-1959, the works are arranged in a mirrored anti-chronological order, so that we end at his beginnings. I recalled that the first time I encountered Venet’s work was in 1969, at the important Museum of Contemporary Art of Chicago show Art By Telephone, curated the new director Jan van der Marck to emphasize the increasingly Duchampian conceptualization of art. It was a show that as a curious high school student deeply marked me. But as I mounted the successive floors, the quality of my art experience descended. (Therefore, I will discuss the show now in the traditional sequential order, starting with his earliest work.) Following an early life of religiosity, where he considered becoming a missionary, Venet instead in 1959 became a stage designer at the Nice Opera House and in 1961 joined the French Army where he started to delve into abstract art by painting with tar and industrial black paint. Attracted by the material viscosity of the thick substances, he would let them dribble and ooze down old pieces of cardboard, and sometimes use his feet to smear them around; à la the gestural style of Gutai artist Kazuo Shiraga’s foot paintings from the mid-1950s. This method of dealing with material fact shorn of any auxiliary symbolic/poetic association, set his path towards the worst of all possible worlds: formalist reductionist solipsism without a hint of poetic or political metaphor. Venet’s self-stated goal was to according to the press release, “remove any form of expression contained in the artwork in order to reduce it to a material fact.” He accomplished this goal, which, for me, plunged him into an dilemma of communicative futility. This dilemma still pervades his art-as-object approach, dovetailing with what I see as commercial market pessimism. Modern art for him was and is just big, factual stuff like the shiny, garish, gloppy, inelegant spray-paint work “Cardboard Relief” (1965) that followed up on his 1963 series of black monochromatic tar paintings, which eschewed all forms of foot action. However, these black monochromes, as pointed out by his artist friend Ben Vautier, came too close to those of Ad Reinhardt, whose black requiem mass for expressionistic painting was already well underway. But that same year, with the nihilistic “Black Book” (1963) and “Pile of Coal” (1963), Venet started finding his capacity as a sculptor of the black material world. To my eye, this “Black Book” and the informal but intimate black dump of coal have the tectonic rumblings of a Tibetan chant, at once plaintive and pitiable. Particularly, “Pile of Coal” has something about it that cannot be rendered insignificant by the immensity of the Anthropocene surrounding it. With “Black Book,” Venet approaches, but never reaches, the absolute no-saying of Reinhardt’s studied mystic pessimism. 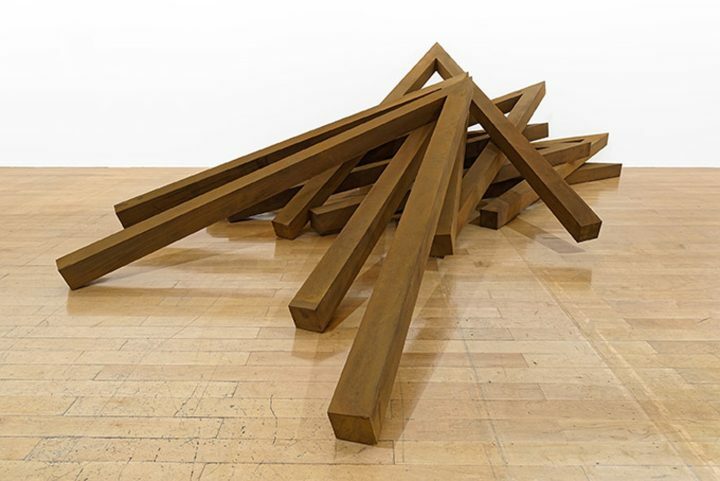 In 1966, during a two-month visit to New York City, Venet’s metaphysical and metaphorical nihilism was deepened by his encounter with American puritanical Minimalism, and he consequently incorporated it into his “just-the facts-ma’am” reductive style. In 1967, Venet moved to New York to live at 84 Walker Street, formerly Jean Tinguely’s studio, and has lived between France and New York ever since, working at the margins of minimalism. From 1971 to 1976, Venet did not create any art at all. I don’t know why, but I presume that his metaphysical pessimism, with its assumption of hard realism, compromised him philosophically by failing to locate his art within a human context. In his high American Minimalist phase that followed, Venet’s measured out white space, such as with “Position of Two Angles of 78˚ and 41˚” (1977) and “Position of Two Angles of 120˚ and 60˚” (1976). These works do look elegantly restrained, but for me are just too derivative of the work of Mel Bochner, particularly his 1970 Sonnabend show 48″ Standards. I desire art that offers a change of factual attitude, a new world outlook, a shift in perspective, over classy, elegant restraint, so I prefer Venet’s later maximalist “Saturation” paintings that also can be very elegant, as in “Saturation” (2009) (not in the show) and “Bugatti Painting” (2012) or garish, as with “Gold Round with Quantification” (2012) and “Round Saturation (Gold) with 23 on Top” (2011). This hung-as-diptych presentation was unfortunately maltreated by the intensity of the blue pigment of the wall on which it was placed. But at least in such “Saturation” paintings, Venet’s reductionist ascetic quietism converts to a yes-saying mysticism that plays at the limits of factual clarity. This principle of overloaded saturation was first used in an early 1968 performance piece Venet presented at the Judson Church where he invited three Columbia University physicists to lecture simultaneously over each other. This old Tristan Tzara maneuver, perfected in Admiral Looking for a House to Rent (1916) which involves several people reading Dada poems in different languages at the same time, was brought back again for the traditional inauguration speech when Venet, Sylvie Ramond, Raspail and Blandine Chavanne all spoke over each other at the same time. For me, with such use of saturation, Venet expressed a Dionysian pessimism of strength and joy, a yes-saying to the messy world as it is, whereas the banal logic of “Position of Two Angles of 78˚ and 41˚” (1977) I’ve now seen more than once — and I didn’t need to see it in the first place. I know that life is like that (factual) and life is hard and is strictly measured out. 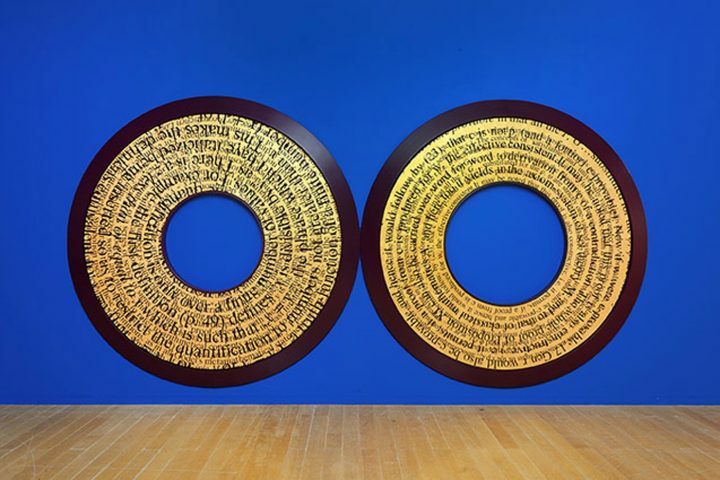 At least in “Round Saturation (Gold) (2012), everything seems destined for a kind of overloaded oblivion-obscurity. Finally, on the way out, I returned to “Indeterminate Line” (1984) on the first floor. It struck me as the finest piece in the show, as the object-hard aesthetic stance taken by “Cardboard Relief” (1965) and “Position of Two Angles of 78˚ and 41˚” (1977) is undone. “Indeterminate Line” shows that Venet’s initial aim of making self-referential art intentionally devoid of expression is continually negated by his later works that entail the expressive energy of indeterminate lines, accidents, random combinations, and dispersions. Thus there is an appeased consciousness here in which his early art of factual, inexpressive, neutral, depersonalized pessimism was really only the failure to imagine a transcendental indeterminacy yet to emerge. 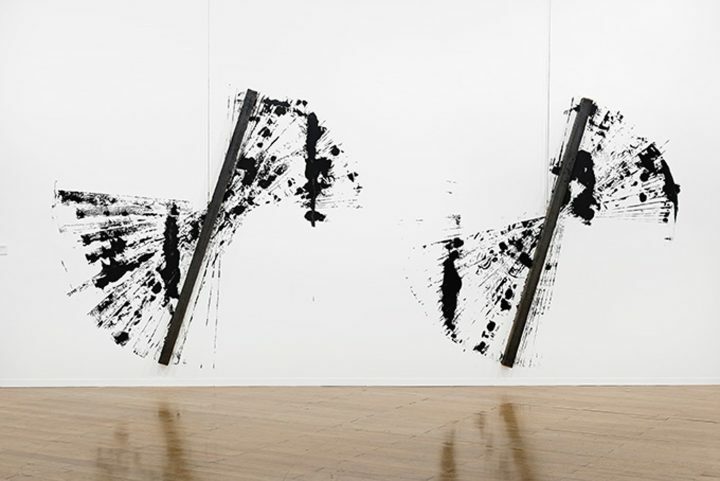 Bernar Venet Retrospective 2019-1959 continues at Musée d’Art Contemporain de Lyon through January 6. The exhibition was curated by Thierry Raspail.